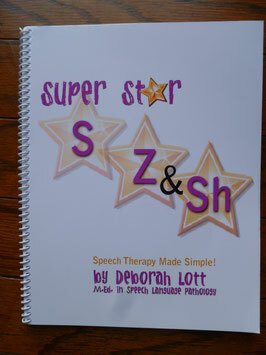 Super Star S, Z, & Sh will aid you in teaching your child to correctly pronounce the S, Z, and Sh sounds. This manual can stand alone for a child with one or two speech sound errors or can be used as a supplement to Super Star Speech: Speech Therapy Made Simple, providing additional pictures and activities. The manual includes specific tips for teaching the S, Z, and Sh sounds at home as well as picture cards, worksheets and games specifically designed for the practice of S, Z, and Sh. All games and activities are unique to this volume. Specific instructions and tips for teaching S, Z, and Sh. Save 30% with the e-book version of Super Star S, Z, and Sh.